Chongqing Science and Technology Museum - one of the ten key projects of social and cultural infrastructure approved by Chongqing Municipal Government - is a modern, integrated and multifunctional venue for scientific and educational events for the public benefit. It is also a science facility which aims to help the authorities carry out their strategy of developing the city through science and education – and also to increase people’s understanding and appreciation of science and culture. The museum - which covers an area of 37 acres - is located in the Jiangbeizui central business dicstrict (CBD), at the intersection of the Yangze River and Jialing River. 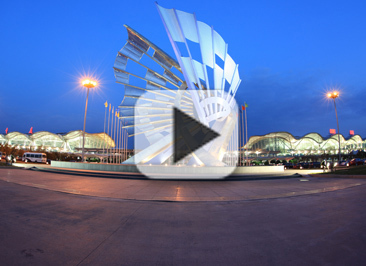 It was built at a cost of 567 million yuan, and the construction was completed in September 2009. The exterior of the Chongqing Technology Pavilion is made of stone and glass and is meant to represent the city’s mountains and rivers – as the multicolor stones are supposedly similar to the hard texture of rocks and mountains, while the glass curtain walls resemble water.